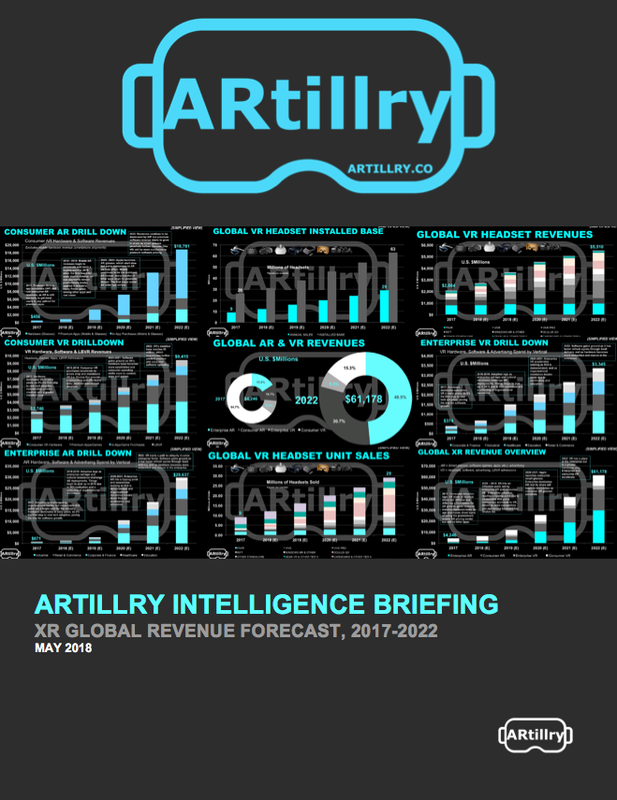 This post is adapted from ARtillry’s latest Intelligence Briefing, XR Global Revenue Forecast 2017-2022. It includes some of its data and takeaways, including original market sizing and forecasting. Subscribe to ARtillry Insights for the full report. Many AR and VR (a.k.a. XR) stakeholders claim that their market sizes will be massive. But how big are they, and how big will they realistically get? ARtillry Intelligence has quantified these sectors and their moving parts in precise terms. The result is our latest XR revenue forecast. 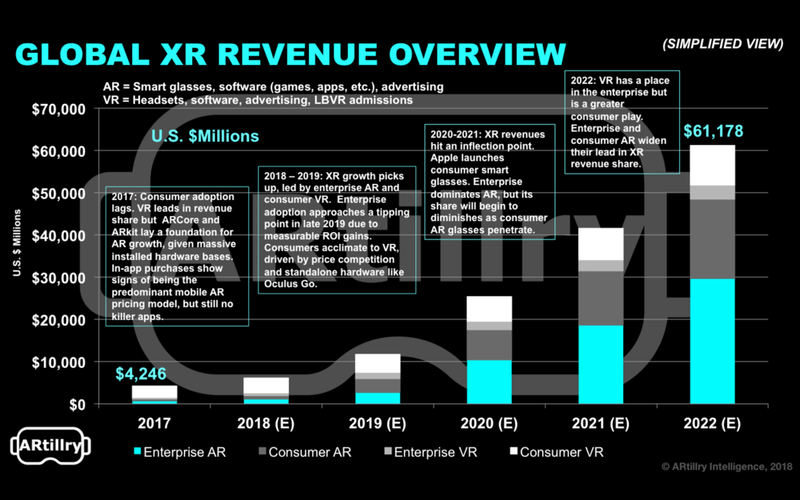 At a high level, we project global XR revenue to grow from $4.2 billion last year to $61 billion by 2022. That consists of AR, VR and the enterprise and consumer segments of each. That includes lots of moving parts, which all come together in an extensive financial model. One common thread among these sub-sectors is that there will be a tipping point for both adoption and monetization in the 2019-2020 time frame. After that point, growth will accelerate and get over the consumer and enterprise adoption humps that persist today. Breaking down the sub-sectors and their drivers, enterprise AR will hold the largest share of revenue in the outer years of our forecast. Scale will result from wide applicability across enterprise verticals; and a form factor that supports all-day use and clear ROI. Adoption is currently dampened by organizational inertia, enterprise risk aversion and sales cycles. These factors will continue to stunt enterprise AR growth but will be outweighed eventually (2020) by the momentum, support and ROI realizations that are currently building. Consumer AR will be the second largest revenue driver. Near term revenues will be mobile and software-centric (mobile device sales aren’t counted as XR revenue). That includes premium apps and in-app purchases — mostly the latter as validated by Pokemon Go and others. Consumer VR takes the third spot for revenue in outer years, and be hardware-dominant in the near term as an installed base is established. Over time, software (apps & games) revenue will gain share, built on that installed base and benefiting from faster refresh cycles than hardware. And the headline within consumer VR is standalone headsets like Oculus Go. At a $199, it hits a sweet spot for quality and affordability, and we project it to reach unit sales of 1.3 million this year. Given a gift-able price point, the 2018 holiday quarter will be a “moment of truth” for Go. Lastly, enterprise VR takes the final spot among XR sub-sectors. VR will be stronger as a consumer play due to relative shortcomings in the enterprise like isolation, which inhibits industrial job functions. However, it will find value in areas like training and data visualization. There are lots of other moving parts and inclusions within the above categories, such as XR advertising (included in enterprise AR & VR) and Location Based VR. It’s all broken down in the full report which you can preview here, including details on what’s included and not included. And we’ll be revisiting excerpts and nuggets from the full report in the coming weeks as we unpack and analyze forecast components. There are lots of individual areas within the XR universe that are ripe for strategic takeaways and value creation. There will be a lot to discuss. Preview more of the report here and subscribe to ARtillry Insights to access the whole thing.